Last week, Ali and I had amazingly fantastical adventures every single day. We found a golden ticket, sailed down a chocolate river in a pink candy boat, saw squirrels opening walnuts without breaking said walnuts, rode in a glass elevator with millions of buttons, and sat on the edge of our seats as a bad little girl got blown up into a giant blueberry and carried off by tiny people. Obviously, we read Charlie and the Chocolate Factory. This was a first for us, and a completely perspective-changing moment for me as a parent. I’ve been reading books aloud to Ali since she was a baby, and started reading chapter books aloud last fall. But because I thought I needed to “hook” her into the idea of letting me read a long book, I bought inane “Tales from Pixie Hollow” books and borrowed ridiculously over-formulaic “Rainbow Magic Fairy” library books. The plots were absurd, the stories all sounded the same, and I was slugging through it. Then a couple of weeks ago, my friends Ashley and Nikki mentioned that they had read Charlie and the Chocolate Factory aloud to their kids. Literature!! Real literature!! Well-written literature!! WHY haven’t I thought of this??? I felt like a complete nincompoop, to use a literary term. The next day, I headed to the library, checked out a few Roald Dahl books, went straight home home and started reading aloud. And from the first chapter, we were both enthralled. We were excited, we were living it, we were completely sucked into the story – as should rightfully happen when one reads good literature. So, in my excitement over this eureka moment, I began compiling a list of all of my favorite childhood books (that weren’t too intense for Ali – she scares easily), and other books that I wanted to read. And I ended up with a to-do list 101 books long. Clearly, this is going to take a while to accomplish. And perhaps, before I finish reading all of these aloud, Ali will take over and read them herself. Here’s my list so far. I plan on printing it out and keeping it in my library bag – feel free to do the same. I would also really love to know what great books I’ve left off – let me know in the comments and I’ll add them! * – books that I haven’t read at all yet. 1. Charlie and the Chocolate Factory – Roald Dahl / Nothing can beat this book’s entertainment value when read aloud. Fabulous story with great moral lessons, and what kid doesn’t like hearing about fantastical candy?? 3-9. The Chronicles of Narnia – C.S. Lewis / Some of my most treasured childhood memories are of my Mom reading this series aloud to us. Engaging and beautiful. 12. Pippi Longstocking – Astrid Lindgren / I loved Pippi Longstocking as a kid! 14-21. The Ramona Series – Beverly Cleary / These were some of the first books that I read by myself, but I also remember my Mom reading them aloud. 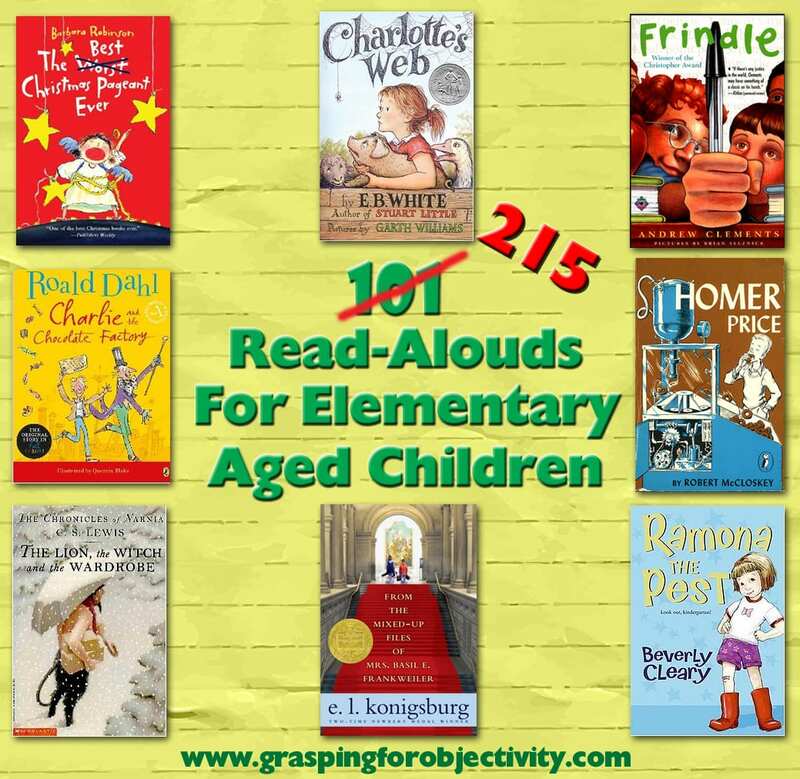 They are great bridge books for both reading aloud and reading alone. 22-26. The Fudge Series – Judy Blume / I loved these books as a kid! Great sibling interactions, and lots to discuss as well. 28. From the Mixed-up Files of Mrs. Basil E. Frankweiler – E.L. Konigsburg / This was one of the most magical, original stories that I read as a young child. I can’t wait to read it again! 29. A Wrinkle in Time – Madeleine L’Engle / I fell in love with Madeleine L’Engle’s writing from this book, and proceeded to read nearly everything she wrote. Not all of her books, however, are appropriate for children. 30. The Best Christmas Pageant Ever – Barbara Robinson / Fabulous story to read around the holidays – cute and heartwarming. 32*. Jotham’s Journey – Arnold Ytreeide / An Advent Adventure Book my Mom recommended33-40. Anne of Green Gables Series – L.M. Montgomery / These are probably too old for Ali right now, but would be great family read-aloud books when she is slightly older. Or, if Ali beats me to it, she can read them herself in a few years. 45-49. Diary of a Wimpy Kid Set – Jeff Kinney / I read a couple of these aloud to Ali over a year ago (with occasional language changes), and she loved them! The pictures are engaging, and the stories are short enough to keep the attention of young children, even if they don’t understand everything. The movie, however, is painful to watch – I hate train-wrecks. 52*. The Watsons Go to Birmingham—1963 – Christopher Paul Curtis / I found this book while researching for this list. I’ve not yet read it, but I am eager to read it myself first and see if it is a good book to introduce the subject of Civil Rights and the sadder parts of the history of our city. 55. The Secret Garden – Frances Hodgson Burnett / This book always made me want to live in a giant manor in England with a large, mysterious garden. 58. Encyclopedia Brown, Boy Detective – Donald J. Sobol / I ADORED these as a kid. I never could figure out the mysteries, though. I was always so disappointed in myself! 67-75. Little House on the Prairie Series – Laura Ingalls Wilder / I have to admit that I mentally relate these as being boring. But I know they weren’t! I remember enjoying them – they just seem boring. 78. The Complete Tales of Winnie-The-Pooh – A.A. Milne / Winnie-The-Pooh stories always surprise me at how creative and refreshing their storylines are. So much better than I expect – every time! 89. Homer Price – Robert McCloskey / This is a rare book to find, but I LOVED it as a kid! Homer had some really fantastic adventures. 95. The Princess Bride – William Goldman / This book was written for adults, and if you haven’t read the book and are a Princess Bride fan like myself, then you’re missing out. With some skipping here and there, it’d make a great children’s read-aloud book as well. I wish they would come out with a children’s version…because, as always, the book is even better than the movie. Please let me know what I need to add to the list! ***Great list from a great web site!!! Thanks Rachel. I loved this list! Teachers are always asking what they should read to their students as well.